If Neymar is one of your heroes make sure you relax in style with the Nike Neymar Dry Football Training T-Shirt. 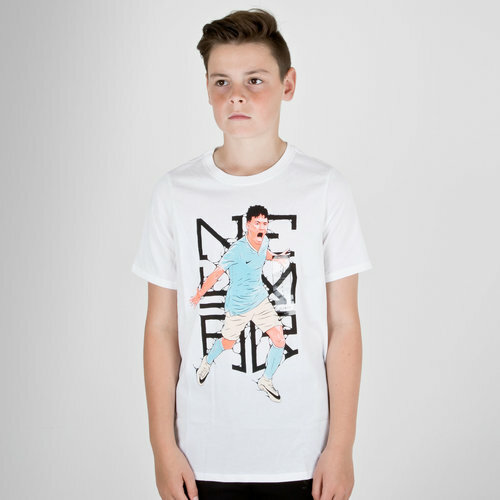 This t-shirt pays homage to the Brazillian superstar, Neymar. If you're a passionate supporter of the Brazillian magician, train or relax in complete comfort and style with this graphic tee. The image of neymar celebrating merges into the 'Neymar' text for a unique style and look. This top is made from a soft tri-blend of fabric 50% polyester, 25% cotton and 25% rayon which combines for a comfortable and lightweight top ideal for supporters duties chilling in front of the tv or even heading to watch a game live.